Chris, a wedding minister in Los Angeles, has appeared in many television shows and even came very close to having his own television show. In November of 2012, Chris Robinson – -the Officiant Guy- – appeared on the season finale of “Couples Therapy. He was asked to be the wedding minister for a couple, who after a period of therapy, received the blessings of the therapists to be married. He married the couple in a civil wedding on television. Chris, a wedding minister in Los Angeles, has appeared in many television shows and even came very close to having his own television show. He has also officiated some very high profile weddings in the press or on television. 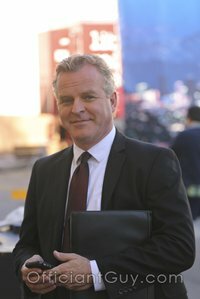 Click on wedding minister Los Angeles to see some of his appearances. If you are looking for a wedding minister in LA who can also issue you a marriage license in Los Angeles County and who does it right with style and class, then the Officiant Guy is your wedding minister. 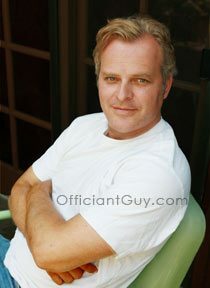 He is the best wedding officiant in California. Chris Robinson is a California wedding celebrant. He has been marrying couples and issuing CA marriage licenses for over 20 years. He could certainly be your wedding officiant for any type of wedding from a secular wedding ceremony to a non secular wedding ceremony together with any kind of inclusions from sand ceremonies to vow renewal ceremonies. If you are getting married anywhere in Los Angeles County give the number one ceremony officiant in Los Angeles a ring at (310) 882-5039 or (562) 547-3255 or fill out the contact form.